At the beginning of my career I was fortunate that Richard Leakey gave me the opportunity to be involved with research at what was then East Rudolf, now Koobi Fora, in northern Kenya. My main contribution was the analysis of the fossil hominin cranial remains, but the opportunity to be part of the broader East Rudolf Research Project provided me with an invaluable exposure to the wide a range of disciplines that are needed to understand how landscapes and biota evolve. It also introduced me to a group of incomparably talented colleagues from whom I have learned, and in some cases continue to learn, a great deal. For the latest updates, visit the Hominid Paleobiology Laboratory webpage. My current research interests are phylogeny reconstruction, hominin systematics, dental evolution, evolvability within the hominin clade, and diet reconstruction; some individual projects are confined to one of these interests, others span several. One of the most compelling lines of evidence for Paranthropus monophyly is that both Paranthropus boisei and Paranthropus robustus have molarized mandibular premolars. Under the monophyly hypothesis this would be considered a shared-derived feature, and if instead the two taxa were paraphyletic, then mandibular premolar molarization would be a homoplasy. Mandibular premolar molarization is unusual in Old World primates, but it occurs quite commonly in callitrichids. 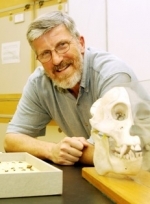 Human Paleobiology student Kes Schroer (Ph.D. 2013) explored the context in which this occurs in these New World primates, to test the hypothesis that molarization of the mandibular premolars is a synapomorphy of Paranthropus. A previous study has shown that the comparative gross morphology of the muscles of the head, neck, thorax and upper limb is consistent with the pattern of relationships among higher primates and among 17 major primate clades that are supported by molecular evidence. It is also the case that while some of the derived features shared among the great apes involve the evolution of independent muscles, others involve the loss, or simplification, of the musculature. In collaboration with GW Alumnus Rui Diogo (Howard University) we will extend this study to the trunk and lower limb to test the null hypothesis that gross muscle morphology in those regions is also consistent with the relationships among the great apes supported by the majority of molecular evidence and that similar examples of loss, or simplification, are seen in the lower limb. We are extending our interest in the evolution of complex character traits from the phenotype to the genotype. Jennifer Baker (Ph.D. 2015) is working with Derek Wildman to examine the genotypic evolution of complex character traits. She is focusing on the molecular evolution of a superfamily of transcription factors, the Nuclear Hormone Receptors (NR), a class of proteins with a strong history of successful protocols for functional analysis on ancient proteins. The evolutionary relationships of the superfamily of NRs are well known, but the biochemical, structural, and functional consequences of molecular evolution in the primate lineage remain unclear. Ancestral sequence reconstruction will allow us to quantitatively analyze hormone-receptor interaction in ancient proteins and thus better understand the evolutionary changes that have occurred in our lineage. We will compare the phylogenetic valence of the hard-tissue morphology of regions of the upper limb with the phylogenetic valency of the gross morphology of the musculature of the same regions to test the hypothesis that the superior performance of the latter is a global rather than a regional phenomenon. Sexual dimorphism is an important source of intra-specific variation, but no study has explored the regional differences in the degree and pattern of sexual dimorphism across the skeleton of higher primates. If there is any consistency in the SD seen in the African ape clade, then the principle of the phylogenetic bracket can be used to predict the primitive condition of the degree and pattern of sexual dimorphism in the hominin clade. To what extent do other mammalian groups in East and southern Africa show examples of regional sister taxa? We are reviewing the evidence within other mammalian clades of sound evidence of sister taxa in the two regions. Are there constraints on the evolvability of dental and gnathic morphology within the hominin clade? To what extent is selection responsible for the patterns of evolution we observe within the hominin clade? Chrisandra Kufeldt, a graduate student, is investigating whether dental microstructure carries any phylogenetic signal. To see Dr. Wood's CV, click here.